Everyone's excited about Abercrombie & Fitch in London, but are the prices and positioning right, asks Nicola Clark. Walking into Abercrombie & Fitch's London store, you would be forgiven for thinking you were entering a nightclub. With its dimly-lit interiors and bare-chested male models, the shop is a far cry from its previous incarnation as a branch of the Bank of England. In the US, where it has more than 350 stores in malls and shopping districts across the country, Abercrombie & Fitch is a $3.5bn brand targeted firmly at college-age consumers. In the UK, though, the brand is adopting a premium positioning and being sold at a significant mark-up. Whether its logo-laden clothes can succeed in the increasingly democratic fast-fashion capital is up for debate. Sophie Dean, senior fashion editor at style bible Wallpaper*, says Abercrombie & Fitch's UK success could be short-lived. 'The novelty factor will wear off quite quickly; to be honest, the clothes aren't that different to Gap,' she says. Abercrombie & Fitch's international expansion has been a long time in planning and began in earnest last year with its first store in Canada. While its flagship London store is its first entrance into the European market, the company has made no secret of its plans to expand in Europe and Japan. Maureen Hinton, senior retail analyst at Verdict Research, says there are significant risks attached to the strategy it has taken. 'Using Canada as a basis for international expansion is not very wise. While its entry there has proved very successful, the Canadians share similar lifestyles and fashion to the US, whereas the UK has a much more urban street style and very sophisticated retail sector to satisfy such styles,' she says. The cost base in the UK is also very different from the US; Abercrombie & Fitch will face much higher operational costs in London. In the US, Abercrombie & Fitch produces an average sales equivalent of £266 per square foot, while in the UK, the average for a mid-market clothing brand is £360, according to Verdict Research. Premium brands such as Gucci and Stella McCartney can command much more. As the costs of opening stores in the UK are higher than in the US, industry experts believe that rather than rolling out a large number of stores here, the brand will use the flagship as a launch pad from which to enter fashion capitals across Europe, as well as drive internet sales. Jeff Kindleysides, co-founder of retail design experts Checkland Kindleysides, says the retailer aims to use the UK as a bridge into Europe. 'It is very provocative and single-minded; the store itself is very much a marketing tool in its own right,' he says. Much of the press coverage of the UK store so far has focused on the significant price differential over the US - leading to accusations that the store is a rip-off. However, Mark Dickens, director of design agency Astound, says such a premium strategy is tried-and-tested. 'In the US, Krispy Kreme donuts are a mass-market fast-food brand, but in the UK they launched in Harrods, with a significant mark-up in price and have successfully carved out a premium niche positioning,' he says. UK fashion brands have long employed this strategy overseas with significant success. While Ben Sherman is best associated with aesthetically-challenged teenagers in the UK, 'Ben Sherman London' has carved out a premium positioning overseas. Raul Shah, founder and chief executive of Exposure, which works with brands such as Levi's, says there is already huge choice on the UK high street, which could cause it problems in the longer term. 'While Abercrombie & Fitch has generated a great deal of excitement, the real test will be whether consumers will come back and make repeat purchases,' he says. Abercrombie & Fitch's collection is fairly static and Shah says the brand is based around a 'single-product aesthetic' - namely the logo-laden sweaters and T-shirts, once worn as evidence of a trip to the US - which may not go down well in a market more attuned to the constantly changing fast fashion championed by stores such as Topshop, Zara and H&M. Fashion experts point to the mixed fortunes of stores such as French Connection and Benetton as evidence of the diminishing popularity of the logo-focused strategy in the UK. 'The past few years have seen European consumers revolt against clothing that turns them into human billboards for the fashion industry,' says one seasoned fashion writer. Pointing to the success of Zara, which has stock chosen to suit each individual store in the country, she says that Abercrombie & Fitch may be too rigid a brand to succeed in the UK market. Retail experts further point to a long line of US-fashion brands that have failed to find lasting success in the UK market. 'Brands such as Phat Farm, Mecca USA and Tommy Hilfiger have failed to differentiate themselves and need to realise it's not the United States of Europe,' says Shah. Abercrombie itself says it will be positioned alongside brands such as Diesel in the UK. However, Kindleysides believes it may lack the quirkiness of these brands. 'US retailers tend to be very prescriptive with their brands and in the UK we have a different way of looking at life,' he says. Judging by the throng of teenage girls already packing into the London store, there is no denying that Abercrombie & Fitch has created a significant impact - whether or not it can be sustained is another question. 1892: An elite excursions-goods retailer, Abercrombie & Co is opened by David Abercrombie in New York. 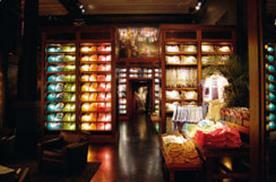 1900: Ezra Fitch, a regular customer, is made a partner; in 1904, the store is renamed Abercrombie & Fitch. 1960-1980: Stores open in states including Florida, New Jersey and Illinois. 1977: Company is acquired by sporting-goods retailer Oshman's. 1988: Sold to US retail giant The Limited, which owns Victoria's Secret, and repositioned as a lifestyle brand. 1990s: Stores open in upscale malls to target teens and college students. 1996: Company goes public on the New York Stock Exchange. 1999: Embroiled in a lawsuit over alleged sweatshop conditions. 2005: First flagship store opens in NY. 2007: First European location and non-US flagship store opens in London.